The European Commission president has criticised the UK's Brexit negotiations, saying none of the papers provided so far are satisfactory. 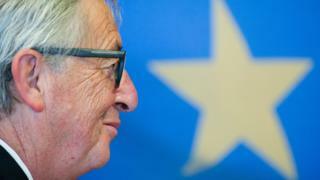 Jean-Claude Juncker reiterated that there would be no trade negotiations between the EU and UK until the divorce bill was settled. The prime minister's spokeswoman said the UK was in a "good position". But EU chief negotiator Michel Barnier said Brexit secretary David Davis had to "start negotiating seriously". The EU has previously said that it will not discuss trade issues with the UK until it has resolved three issues. One of the the sticking points is the rights of EU citizens living and working in the UK post-Brexit, and the rights of UK citizens in the EU. EU negotiators also argue a decision on the Irish border, and the size of a financial settlement between the EU and UK, must be met. But British negotiators have said they are not going to give up their biggest negotiating card at such an early phase. The UK government published its position papers in August, one of which which called for no additional restrictions for goods already on the market in the UK and EU. The BBC's Europe correspondent Kevin Connolly said "the British perception of the talks is more positive than the EU's", and added UK officials were "puzzled" at how dismissive Mr Juncker was of the papers. Mr Juncker said: "I find none of [the papers] truly satisfactory. "We need to be crystal clear that we will begin no negotiations on the new economic and trade relationship between the UK and the EU before all these questions are resolved... that is the divorce between the EU and the UK." He has previously claimed that the UK's Brexit bill could be £55bn, which Theresa May's government ministers consider unacceptable. Mrs May's spokeswoman added: "We are seeking to agree by October Council that we can move to talk about our future relationship." Later, a government spokesman said: "The PM has made clear that we will be seeking a deep and special partnership with the EU, that works in the interests of businesses and consumers in both the UK and the EU. "We have published a paper that lays out the government's aspirations for the UK's future customs arrangements, and also makes clear that we want an implementation period that avoids a cliff-edge for business and allows a smooth and orderly exit from the EU." At the end of October, the 27 remaining EU leaders will meet and consider whether enough progress has been made on separation, rights and financial issues. It is possible they could agree negotiations on trade and the UK's future relationship with the bloc. Michel Barnier is due to meet David Davis again on Thursday, and officials said the third set of Brexit talks between the two on Monday were cordial and productive. The talks involve more than 100 British negotiators, who will take part in 55 hours of discussions this week. At a press conference following Monday's negotiating session, Mr Barnier said the UK had to "take positions on all separation issues" and "start negotiating seriously". Mr Davis said the UK wanted the current week of talks to be about "driving forwards the technical discussion across all the issues".